**** SVP CLIQUEZ SUR LE "DEMANDEZ AU PROPRIÉTAIRE UNE QUESTION DE MEILLEUR TARIF ******"
Condo ensoleillé et bien aménagé pouvant accueillir jusqu'à 4 personnes pour des locations flexibles d'un mois ou plus. Prix ​​pour le prix, il est pratique de couper le souffle sur les falaises au niveau du coucher de soleil du parc surplombant l'océan. Lieu idéal pour se détendre, que ce soit pour se réveiller ou pour aboyer des lions de mer, se prélasser devant la télé, se promener dans les boutiques et les musées, ou prendre un jacuzzi dans la baignoire pour profiter du son ambiant de Bose. À quelques minutes des galeries d'art, des restaurants, de la plage ou de la vie nocturne. Intérieur remis à neuf, peinture neuve, salle de bain surclassée et Wifi. Visitez Laguna Beach sur un budget, marcher dans la ville, et découvrez comment "l'autre moitié" vit. Condo is well located in the heart of Laguna Beach, a block from beautiful Heisler Park on the ocean. It is clean, comfortable, quiet, well-stocked with amenities for daily needs, and nicely furnished with attractive paintings on the walls. We enjoyed our stay very much. I’m glad you enjoyed your stay and look forward to seeing you again next year. A second-story walk-up, two minutes walk from the beach, 5 minutes to gorgeous restaurants, everything is convenient, what more could you want? Laguna Beach is a fabulous city, with art galleries on almost every block, the beach life of surfers moving to the water, and hundreds of interesting restaurants. Transportation is easy with the trolley. The local pizza is amazing. With hotel rooms nearby at approximately $500 per night, this is an outstanding value. My stay here is only limited by the availability of the property. The amenities are those of a hotel room, without the concierge. The owner offers a "blue book" of information that makes answering questions easy, and is very flexible with requests. I am a repeat customer and would highly recommend this listing. We have stayed at this great condo twice and hopefully will return many more times. The location is the best as you can walk everywhere in Laguna. Or take the trolley which stops at nearby corner. The owner is wonderful and very accommodating. 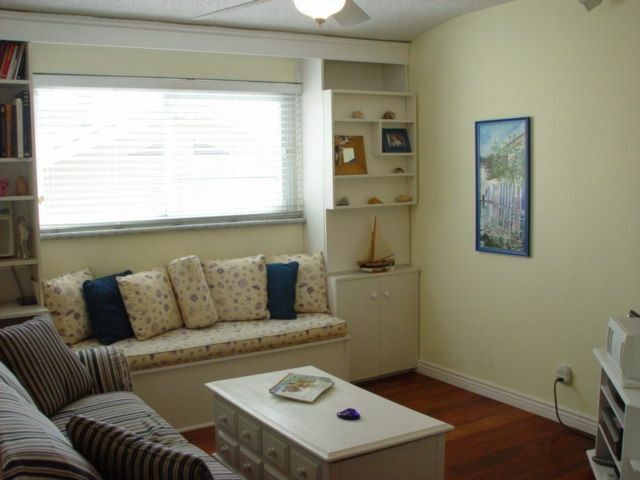 The unit is immaculate and you can tell it is well cared for. I highly recommend this vacation rental for your stay at the beach! Thanks so much for your review. I hope to welcome you in the future! This condo was absolutely wonderful in so many ways for my month-long vacation!!! The location is perfect being so close to two of the nicest beaches (Picnic and Diver's Cove) in Laguna and Heisler Park!!! The condo itself was clean, spacious and had everything I needed/wanted in order to feel like home! Restaurants and stores were all within walking distance and the trolley was easily accessible to go to further points of interest!! The owner was a pleasure to work with and provided extensive information on how to work everything in the condo as well as took time to show and explain things to me when I arrived. I highly recommend this condo and would love to stay here again in the future!! !